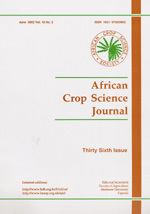 The African Crop Science Journal (Afr. Crop Sci. J. ), ISSN 1021-9730/2015 and eISSN 2072-6589/2015, is a peer reviewed Journal established in 1993. The primary objective of the Journal is to provide a forum for disseminating quality research results on Tropical Crop Science, and enhancing their availability to researchers and development agencies in Africa and other developing countries. The most important characteristic of the Journal is that it addresses, all aspects of Crop Science and Production in an integrated manner. All opinions, and articles published in the Journal reflect views of the authors and not necessarily those of the African Crop Science Journal. Submission of a paper implies that it has not been submitted or published elsewhere, and that the authors accept the conditions for publication outlined in the Journal. Once accepted for publication, authors transfer copyright of their articles to the African Crop Science Journal, unless expressly exempted in writing by the copyright holders. The Journal allows self - archiving of all published papers. The Afr. Crop Sci. J. exercises the Open Access article policy whereby the papers can be accessed under the terms of the Creative Commons 3.0 Uganda (CC BY 3.0 UG) Attribution License. By this license, use, distribution, and reproduction (except for commercial purposes) is unrestricted, provided attribution of the original work is properly executed. The articles are freely accessible (full text) online at www.ajol.info and www.bioline.org.br/cs, at no cost. The journal materials are available in machine readable data (or metadata) at the host websites. Use of illustrations is also cost free as long as citation is made to the authors of the article. The author holds the copyright and African crop Science Society is responsible for its administration. The author is free to reuse the article for various purposes except for those that can amount to self-plagiarism. Journals can make copies of articles published in the Afr. Crop Sci. J., immediately, for custody in trusted third-party repositories. Readers can also access the Journal’s readership statistics at www.bioline.org.br/stats/). The Journal is indexed at CABI, African Journal Online (AJOL), Bioline International and TROPAG. It is also indexed at the Internal Science Index (ISI) (http://isindexing.com/isi/journaldetails.php?id=2104) for Impact Factor. Quality control policy and conflict resolution: African Crop Science Journal operates a zero-tolerance policy to research and publication misconduct (including plagiarism, falsification, cheating and other forms of ethical misconduct). Offenders are alerted and barred from subsequent publication with the Journal, unless they provide satisfactory rebuttals. We use the twoanonymous tire peer reviewer system, and adopt a third one in case of conflicting review reports. We leverage global pool of experts for peer reviewers from Google Scholar for various disciplines. This is very helpful in resolving local conflicts within our limited and fairly slow review system. Ultimately, the editorial committee evaluates the reviewers’ reports for objectivity and adequacy. The outcome, in part forms the basis for further considerations for re-appointment of reviewers. Feedback from the journal readership, authors, reviewers and International Editorial Advisory Board constitutes key input into the journal’s self assessment system. As much as possible, the editors avoid appointing reviewers from the country of origin of the manuscript. Business models: The African Crop Science Journal entirely depends on payments for publication fees by authors of accepted papers. For each accepted article, as of 2015, a fee of US$150.0 for non-members and US$100.00 for members of the African Crop science Society. Occasionally, the Journal Secretariat is contracted to edit proceedings and books for other organisations.